Resonation is Joplin area’s Celebrations with IMPACT innovator ~ delivering truly unmatched entertainment value at our price point! We are not satisfied unless all your expectations are exceeded; sparing no expense and working tirelessly to create cherished moments for you and your guests. This is our passion, our labor of love ~ making memories that resonate for a lifetime. Milestone achievements and celebratory occasions punctuate our lives and afford Team Resonation the opportunity to create the ideal atmosphere for you and your guests! With no tolerance for the ordinary, our disc jockey custom tailors each song to suit your unique vision then plays for your guests through an elaborate, concert quality, sound system! Mixing multiple genres and eras into one grooving track, DJ Shane sets the tone for your memories one track at a time. Your guests will be ever surprised and anxiously anticipating the next musical experience. No stopping there though! We also illuminate your indoor and evening events with music synchronized, moving head LED and Laser lighting comparable to a city night club experience! Even further still, Michelle, Resonation’s own Mistress of Mischief, will be on your dance floor acting as your emcee, starting your dance party, and bringing your guests together coordinating fun games and activities! All this while twin video projections of movie clips, celebrity endorsements, dance videos, and fun animations are visualized for those guests who think they can remain seated! When all is said and done, you have one “happening” event people will still be talking about weeks after the evening comes to a close! If this is not enough; well, talk to our Event Consultant and see what other “mischief” you might stir up. With Michelle as your partner in crime, there is no limit to the excitement we can create for your guests! Any way you examine it, you won’t find more value for your investment. 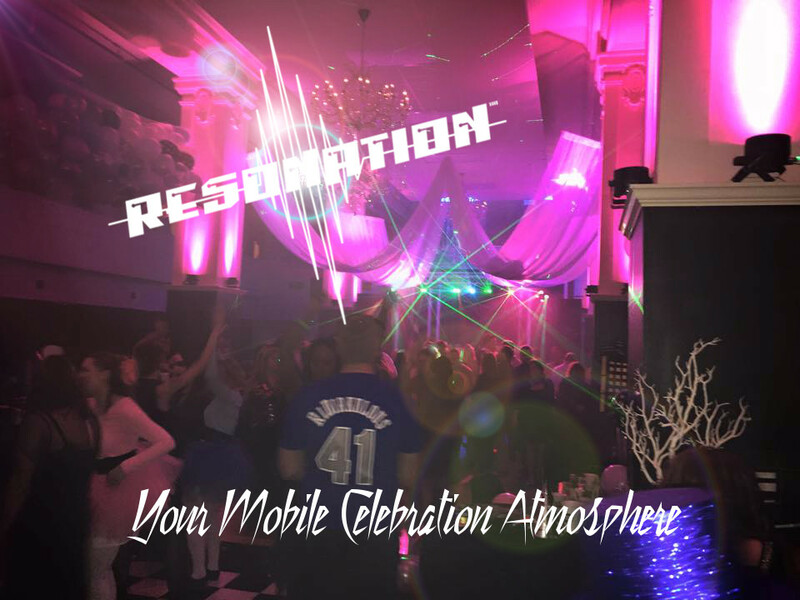 Resonation is Your Mobile Celebration Atmosphere! And, for a modest fee to cover our expenses, we’re happy to travel even further!